Henry enjoys chews and treats, but he doesn’t get them as often as he likes because he is so prone to putting on weight. He eats thin rawhide really quickly; they don’t keep him occupied for long. But if you give him larger or thicker rawhide chews, he quickly gets fed up with them – I think it’s too much effort for too little reward! We’ve tried other meat based chews, but tends to gobble them up really quickly and is soon asking for more. They also tend to be quite high in calories and fat so are not good for his waistline! So when I heard of a dog chew that is long-lasting and very low fat, I thought it would be great for Henry to try. 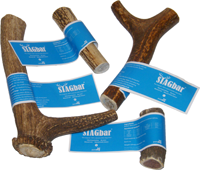 Stagbar antler dog chews are 100% natural and last longer than any other chews on the market. They are available in four sizes – small, medium, large and extra-large. Puredog, the company behind the Stagbar products, kindly sent Henry, Bandit and Skipper an antler chew each to try. The first thing I noticed upon opening the packet containing the chews, was they had very little odour. I’m not sure why, but I was expecting them to be smelly! The antlers are obviously very hard, and with them having so little smell I wasn’t sure if the dogs would like or have the patience for them. I was under-estimating the appeal of the dry marrow inside the antlers though! The first thing Henry did was lick and lick at the marrow, until he eventually realised he had to put a bit more effort to get more of the tasty marrow! Over the last few weeks he has spent hours chewing at it, and there is still lot left, so puredog are definitely speaking the truth when they say this chew is long lasting! We leave the chew out for him, near his bed, and he often picks it up throughout the day to have a quick chew. It doesn’t seem to be losing it’s appeal either, despite it taking quite a bit of effort, so the marrow must be very tasty indeed! The chews wear down slowly with the grinding action of the teeth and the dog’s saliva, eventually exposing the marrow which is a very tasty treat for them. They are safe, don’t splinter or chip, and contain natural mineral goodness. Rawhide chews can often leave messy marks on carpets, but the stagbars are very clean and have left no marks at all on our carpets. Another benefit of the stagbar is that they gently clean your dog’s teeth.